has been taking skydiving medals since 2006. (Eleven of those are national podiums, four are international.) 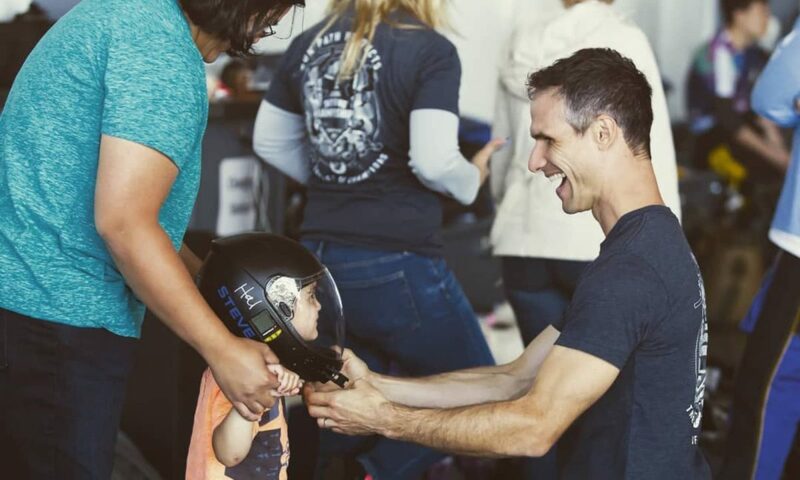 To date, he has logged more than twelve thousand jumps, a goodly number of which have been alongside his wife and Rhythm co-founder: the inimitable JaNette Lefkowitz, a founding member of the Women’s Skydiving Leadership Network and also an athlete of significant note. 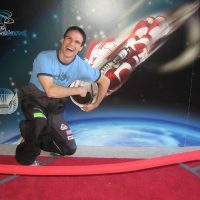 Along the way, Steve has contributed enormously to the sport, whether it be the prodigious amount of top-shelf coaching with which he has leveled up the skydivers who come to him, or through the technological means, he has co-innovated to spread good information even further (more on that later). …So perhaps it’ll come as a surprise that he pretty much-hated skydiving for a good long time. As it turns out, Steve’s star-crossed love story with skydiving started with a decidedly un-star-crossed love story with JaNette. It all starts between 1996 and 2000 when Steve was studying Chemical Engineering at MIT. Luckily, that isn’t completely true. He left that little school in Cambridge with something else: someone extraordinary. JaNette was there at MIT, too, studying Mechanical Engineering. They met at smoothie night at Steve’s fraternity. The magnetism there was instantaneous. She was a lot to keep up with; luckily, Steve is also fast on his feet. Steve went into business consulting, and JaNette’s cousin, Hal Spence, introduced her to skydiving with a tandem. She loved it and immediately signed up for her AFF. Steve, who was living in another state but still seeing JaNette at that time, agreed to come along — despite a total lack of interest. “I didn’t really particularly enjoy it,” he laughs. JaNette, on the other hand, loved it. She jumped for the next three years, as much as she could afford. 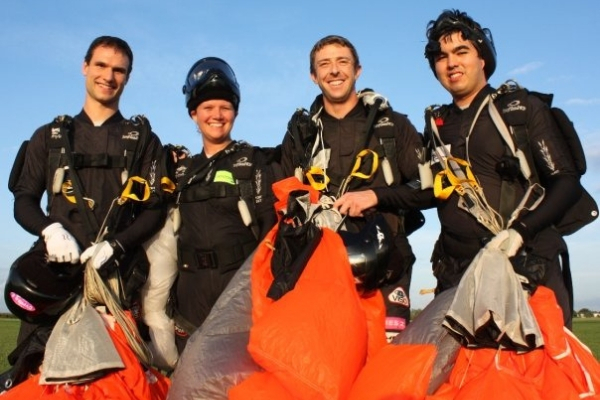 As much as she could, she went out to the drop zone — joined a team — excelled. Sometimes, Steve would go to the drop zone with her and run. 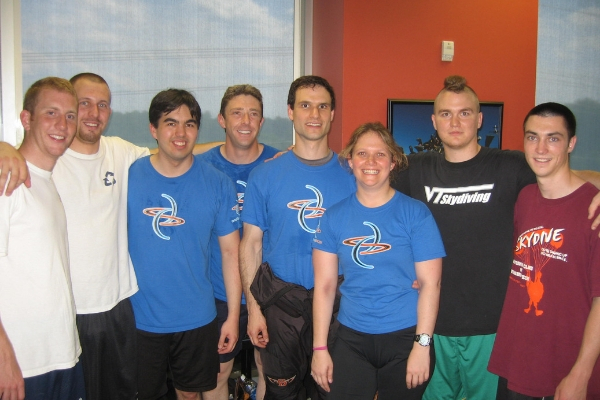 One fateful day, JaNette won free tunnel time at iFly Orlando in one of her skydiving competitions. When the team went down to Florida to fly the time, Steve came along. If it weren’t for the fact that JaNette’s parents live close by, he insists he wouldn’t even have gone. He did. And — miracle of miracles — he liked it. 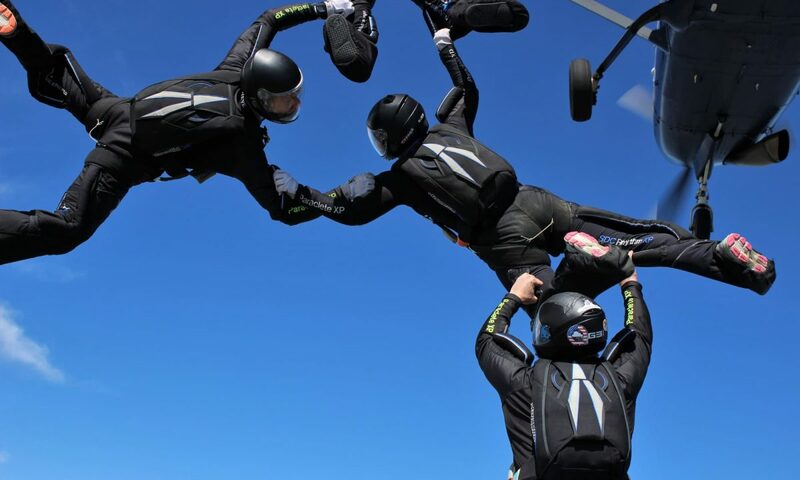 “Pretty much immediately, I got to appreciate the athletic challenge — the fun of flying your body and controlling yourself in the wind and being able to move around,” he remembers. For the next session, when they asked him in, he said yes, no arguing. By later on in the day, he was asking them. By the end of the weekend, he had logged about 40 minutes — nothing to sniff at, especially for someone who had no intention of doing any. After he had that A-license stamp in his logbook, he was jumping every moment he could. When he was still in business consulting, he’d tell work that he was working from home, go to the dropzone and jump. When he took calls, he’d sprint out to take it in the cornfield, just far enough from the loudspeaker that it wouldn’t blow his cover. “She was so much better than me that any team would have JaNette was too good to take me,” he laughs. “Eventually there was a team that — well, honestly, my impression is that they had no other choice. They asked me to join.” In the end, when both teams were done, Steve, JaNette, and one of Steve’s teammates — Laurent Beaudouin — wanted to keep going. They tapped Robert Cromy as a player-coach and started Rhythm. Not content with simply competing, Steve and JaNette — at this time, comparatively quite new — immediately took on the mantle of Coach. Every team debriefs their training, sure — but Rhythm takes that much farther. 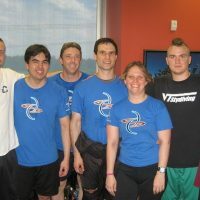 As a team, they debrief — every time — their instructional performance at coaching events and activities. 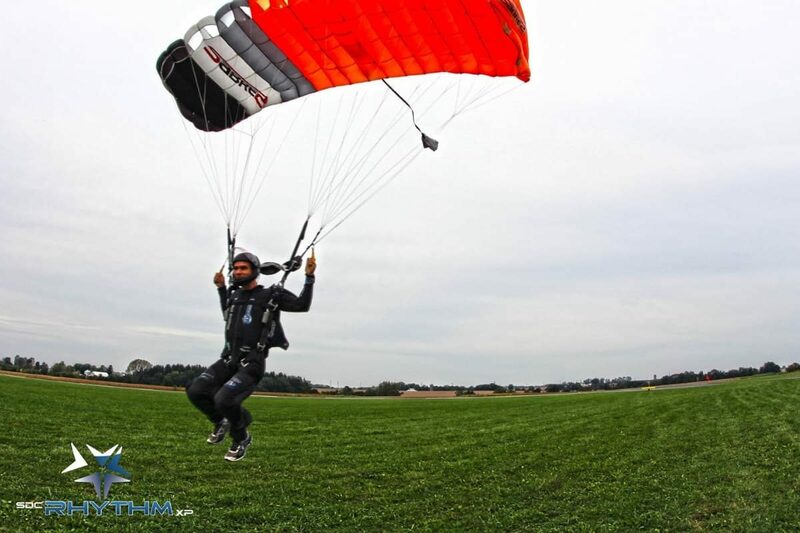 One of the additional methods Rhythm are using to get their hard- and long-earned knowledge into the skydiving community is one of particular interest to other optimization-minded skydivers: the Rhythm 101 mobile app. This incredibly rich resource puts soup-to-nuts information on a wide swath of topics into a well-designed, simple-to-use ready reference, and should be on every skydiver’s phone. (It’s free!) Rhythm 401 is the perfect mobile companion for any skydiver looking to expand her horizons and learn more about 4way. It has a lot of free functionality — plus, a paid subscription provides access to hundreds of videos. If you need even more, here’s another great example of Rhythm’s passion for purposeful progression. Justin Wageman — Videographer, new to Rhythm this year — holds a Ph.D. in Education. Last year, when he was a student of theirs, Rhythm asked him to come out and to shadow the team for one of their coaching events and to do a deep debrief. He volunteered his time, came out for the weekend and took extensive notes. 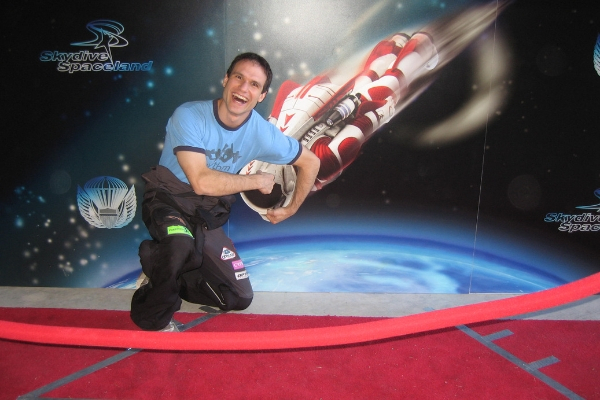 More than anything else, that’s what propels Steve, as a skydiver and as a person-at-large. It’s quite evident that the core value Steve is chasing, when it comes down to it, it is the idea of continuous improvement. CYPRES is proud to support Steve Lefkowitz and SDC Rhythm XP. 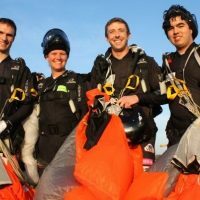 To reach out to the team for coaching, contact them through their website at rhythmskydiving.com. Download the Rhythm Skydiving 401 app and Rhythm Skydiving 101 app for iTunes or Android.